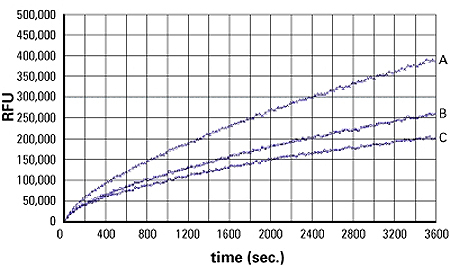 The QBT™ Fatty Acid Uptake Assay is a homogeneous assay amenable to high-throughput screening. The kits deliver pre-optimized, fluorescence-based formulations to expedite assay development and screening of fatty acid transporters. SpectraMax Glo Steady-Luc Reporter Assay Kit provides accurate and sensitive measurement of luciferase expression with a wide dynamic range and extended signal time window. Figure 1: 3T3 L1 adipocytes were plated at 50,000 cells/well in 100 µl of DMEM/FBS in a 96-well plate and incubated at 37°C for 5 hours. Growth medium was then replaced with fatty acid uptake solution. 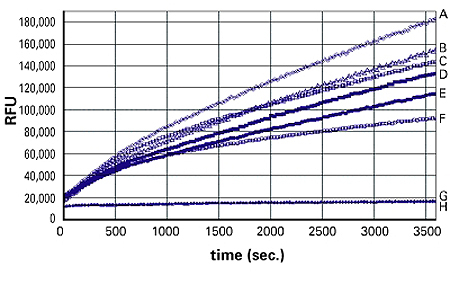 Kinetic readings were started immediately with a Molecular Devices FlexStation® 3 Reader. A: adipocytes; B: fibroblasts; C: no cells (uptake reagent only). Figure 2: 3T3 L1 adipocytes were plated at 50,000 cells/well in 100 µl of DMEM/FBS in a 96-well plate and incubated at 37°C for 5 hours, then serum deprived for 1 hour. Different concentrations of insulin were added into the well and incubated for 30 minutes at 37°C, 5% CO2 incubator. 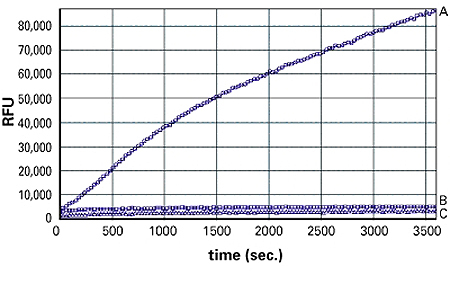 At the end of the incubation time, 100 µl of fatty acid mixture was added into the well, and kinetic readings were started immediately with a FlexStation® 3 Reader. Traces A to F correspond to adipocytes with 160, 16, 8, 1.6, 0.16, and 0 nM insulin, respectively; traces G and H correspond to fibroblasts with 0 and 160 nM insulin, respectively. Figure 3: 3T3L1 adipocytes were plated at 50,000 cells/well/100 µl of DMEM/FBS in 96-well plate for 5 hours, then serum deprived for 1 hour with or without leptin (100 nM). Insulin at 10 nM was then added into the well and incubated for a further 30 minutes at 37°C, 5% CO2 incubator. At the end of the incubation time, 100 µl of fatty acid was added into the well, and kinetic readings were started immediately with a FlexStation® 3 Reader. Data courtesy of Cambridge Biotechnology. A: insulin, B: insulin and leptin, C: basal. QBT Fatty Acid Uptake Assay Kit includes a loading buffer that contains fluorescent fatty acid analog, along with a quenching dye to greatly reduce fluorescence in the extracellular space. When the loading buffer is added to cells, transport of fluorescent fatty analog into the cells results in an increase in fluorescence signal that is monitored in real time using a bottom-reading fluorescence microplate reader. Inhibition of fatty acid transport by test compounds results in reduced fluorescent signal relative to controls. For more details, please refer to the QBT Fatty Acid Uptake Assay Kit product insert, which may be accessed through the Molecular Devices Knowledge Base. QBT Assay Kits from Molecular Devices employ a quenching dye to reduce background fluorescence and improve the signal-to-noise ratio. The patented quench technology is offered to drug discovery and life science researchers exclusively by Molecular Devices, through the purchase of QBT Assay Kits. Quenching technology is covered under U.S. Patent 6,420,183 and EPO Patent 0 906 572. BODIPY is a registered trademark of Life Technologies Corporation.